SAN FRANCISCO — Frustration started seeping in for the Cavaliers late in Friday night’s game, and it continued after Golden State’s win put the Warriors one victory away from back-to-back NBA titles. LeBron James and Draymond Green got physical with each other and exchanged words late in a 108-97 win that gave the Warriors a 3-1 series lead. James and Stephen Curry had words, too, but it got heated between James and Green. James lobbied for the league to suspend Green for Game 5 for hitting James below the belt. Cavaliers coach Tyronn Lue was short on questions about his decisions and whether he played James too many minutes, and he griped about his best player not getting whistles. Those are all signs of a desperate team, one that’s on the ropes and is looking for something to bail it out and help change the direction of the series. Teams have fallen behind 3-1 in the NBA Finals 33 times, and not one of the previous 32 won the title. The Cavaliers have looked overmatched and overwhelmed, even with Curry keeping a low profile before his 38-point performance in Game 4. Golden State’s three wins have been by 59 points. The Cavs don’t have the talent, speed or depth to keep up with the Warriors. James’ teams have made the Finals six straight years, but his season could end Monday night with his third straight Finals loss. You wouldn’t expect James to go out without a fight, but he also was looking for help. He wanted the league to review the play with Green and determine whether he should be suspended for Game 5. During their dust-up, Green fell and James stepped over him. Green, who has a history of flailing arms and legs, flailed his arm as he was trying to get up and struck James in the groin. The two jawed at each other and needed to be restrained. In the Western Conference finals, many thought Green should have been suspended for kicking Oklahoma City center Steven Adams in the groin. The league didn’t do that, deciding to fine him $25,000. If James is upset with anyone, it should be with his own team. The Cavaliers had a chance to get back into the series Friday night, and as good as Curry and Klay Thompson were — they totaled 63 points — it was a close game in the fourth quarter. But Cleveland’s execution was not championship-worthy. Kyrie Irving and James took 19 of the Cavaliers’ 21 shots in the quarter. Many of them were in isolation, or late in the shot clock after Irving dribbled and dribbled and dribbled. On the Warriors’ side, the ball was moving. In the fourth quarter, Andre Iguodala and Sean Livingston each took as many shots as Thompson and one fewer than Curry. You want your stars to have the ball with the game on the line, but all that standing around by the Cavaliers helps the Warriors defensively. In the second half, Irving and James totaled 33 of the Cavaliers’ 38 shots. It was a strange game for James. 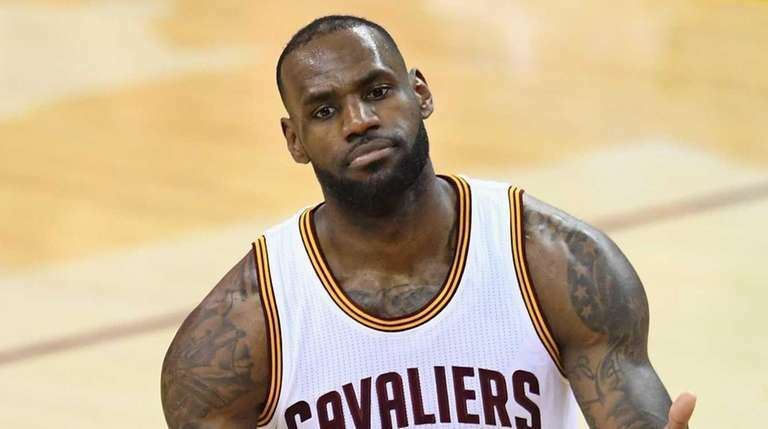 He finished with 25 points, 13 rebounds and nine assists, but his game lacked the aggressiveness he displayed in Game 3 in leading the Cavaliers to a 30-point win. Lue complained that James took only four free throws, but he didn’t attack as much, which was surprising considering the magnitude of the game. James called the past two games “do-or-die.” The next one surely is. The Cavs need a win to force a Game 6 in Cleveland. “We’ve just got to get one,” James said. “Let’s get one. We’ve already got to take a flight back home anyways, so we might as well come home with a win and play on our home floor again.